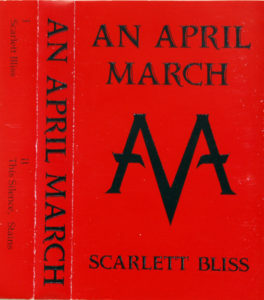 I remember the first time hearing Canadian dreampop band An April March. I was deep in my shoegaze phase in my freshman year of college, overdosing on Slowdive for the most part, posting on forums everywhere. I caught wind of this band and remember seeking out a lone mp3 of “Lava,” one of the bands early singles, on Audiogalaxy of all places… It was love at first listen. Just a few weeks later, I was digging in my college town’s record bins casually when I came across a gorgeous looking gothic cover. Sure enough, it was the Lava single, a red colored slab of perfection sitting there for a dollar, discarded among a bunch of sleeveless pop singles. I believe I posted the single in the very first year of this blog, as the obsession still ran deep. Since then I’ve obtained all of their discography in various forms, with the exception of the elusive Scarlett Bliss demo tape from 1991, which I’ve always had my eye on. 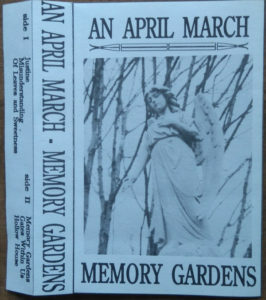 However, a kind collector by the name of Paul Evans offered to rip it for me, and included a bonus- a never before logged demo tape from 1990 called Memory Gardens, the band’s first official release. Funny enough, this is the real treat here, as the Scarlett Bliss tape features very similar (if not the same) recordings of these three tracks that would appear on 1993’s Impatiens, the band’s debut album. However, the songs on Memory Gardens showcase a band just getting their feet wet, though the band’s trademark dark dreampop sound is still in full effect. Mostly I’m pleasantly surprised by the ample use of saxophone on this tape, a sound they abandoned after release, apparently. Saxophone player Ian would go on to play with The Dervishes, who I haven’t heard but sound like a more soul/funk band according to their discogs page. Anywho, four of the six tracks on this cassette are exclusives, while “Gates Within Us” and “Of Leaves And Sweetness” are early versions that have since changed drastically in subsequent recordings.